Nordic — Office of Architecture’s impressive new terminal for Oslo Airport has garnered much positive attention. Created in conjunction with NSW architects, the structure is widely admired not just for its elegant, aerodynamic curves, its legibility and clarity of programme, but because of the way it makes those who use it feel. It does what virtually no other airport (above a certain scale) in the world manages to do: create a seamless sense of welcome and arrival, easing the user passage through what is usually the most utilitarian and often hostile of infrastructural experiences, to deliver them, calm and refreshed, to their departure gate. For arriving passengers, to the integrated rapid-transit train station that sits at the centre of the airport, waiting to whisk them into Oslo Central in just under half an hour. The Oslo-based practice had designed the original international Gardermoen airport, opening in 1998, so was able to maintain an integrity of form and materials which undoubtedly adds to the holistic and seamless, Scandinavian aesthetic. The new terminal doubles the size of the existing building to 280,000 sq m, increasing passenger capacity from 19 million to 32 million (with a further potential increase to 36 million). Nordic partner Christian Henriksen says the most important design decisions arose from wanting to create a sense of place: ‘This has to be a gateway to Norway.’ The decision to locate Gardermoen in open landscape to the north of Oslo, near forests, was part of the original place-making strategy, as was incorporating as much timber as possible into the design. 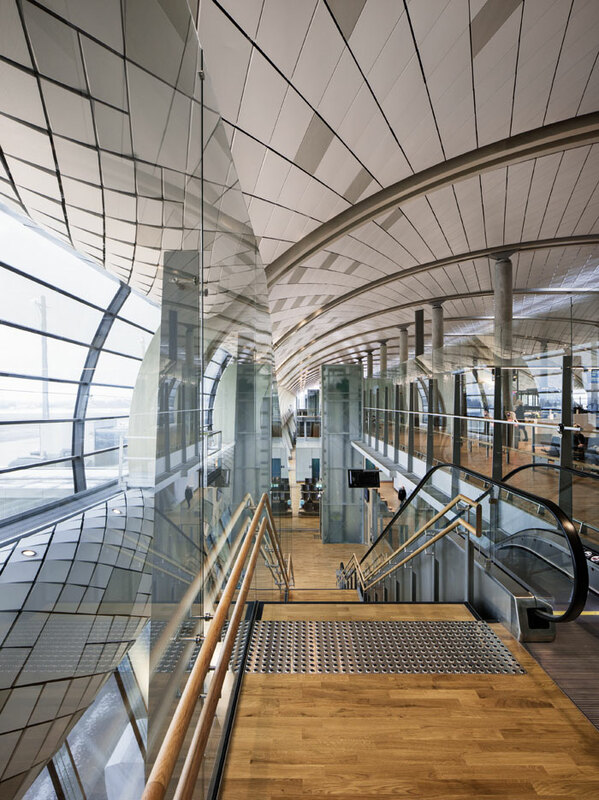 A panoramic window at the north end of the North pier, along with a 300m-long skylight and curved glazing on both sides, opens up the view to the surrounding landscape and floods the terminal with daylight. High-ceilinged and substantially daylit, the arrivals and departure halls are framed by elegantly curved oak beams and parquet flooring. Other energy-saving measures include storing winter snow from runways to be used as coolant in the summer and ground source heat technology, powering the buildings. All these initiatives combine to reduce the airport’s carbon footprint by 35% and energy consumption by 50%. It is the first airport terminal in the world to receive BREEAM Excellent rating. Inspired by the idea of creating a ‘stress-free and fluid’ experience, Nordic has incorporated water features and vertical gardens, along with eco-friendly lighting that changes over the course of the day, adding a more golden, warming light as it gets dark. Walking distances are kept to a maximum of just 500m by stacking domestic and international zones. For the visitor there is a novel sensation of being hosted rather than assaulted. After passing through the rigours of security, they are not forced down a glittering parade of shops. The visitor can choose the retail-strewn option but is offered the choice not to, via an alternative pathway that draws them into a genuinely attractive lounge, with windows on to the graceful choreography of taxiing planes against a backdrop of pine-covered mountains. Food and beverage options take the form of low-level pavilions, partially open to the ‘street’, every bit as attractive as those you would find on the actual streets of Oslo. Lighting hangs low over tables, creating an intimate, friendly atmosphere. Having made airports something of a speciality — designing Bergen, Keflavik, Stockholm Arlanda and Hyderabad airports — Nordic’s next challenge is creating a new airport for Istanbul, opening in 2019. Fingers crossed it can maintain some customer friendliness in a structure billed as the world’s biggest airport terminal under one roof, boasting six runways, the world’s biggest duty free shop and a capacity for 200 million passengers.